This family of mares was selected in 1998 and 1999 from the long-standing ﻿Froelich Ranch ﻿in ND due to their concentrated amount of Leo breeding, excellent maternal lines and reputation as ranch horse producers. These mares all rode with lots of sense and big strides. Each has been great producers-they consistently mother really stout colts that are often top sellers in our sale. An added bonus is color, as a group they have produced about 90% roans and grullos to date. See more pictures and additional history on McKeag by clicking here. McKeag Queen Jewel is bar none our stoutest broodmare-a trait she passes on to her offspring. Her extra volume, muscle & mothering ability result in her colts being very impressive on sale day-most have been among our top sellers going to OK, MO, IA & KS. 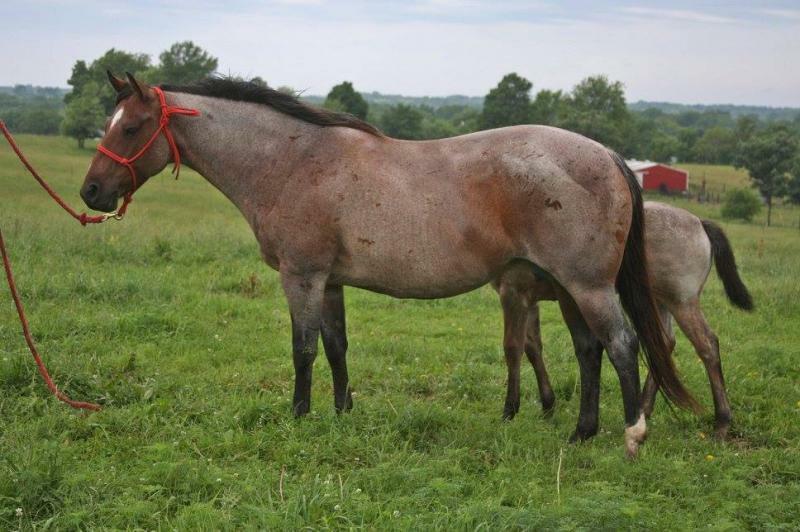 We've retained an excellent blue roan daughter of her by Blue Max Hancock who is becoming quite a producer in her own right. Gotta love these ﻿McKeag﻿ mares and their excellent maternal qualities.